The art deco family compound has been transformed into a premiere boutique villa by the Washington, D.C. based firm, Hollis Leland Design. The seaside residence is situated on three levels cascading to the water's edge, and features two three bedroom suites with private terraces, a separate one bedroom suite, and dramatic swimming pool, all with panoramic views. The unique location provides the convenience of in-town living combined with complete privacy and an exceptional oceanfront setting. DETAILED CALENDAR: PLEASE SEE OUR WEBSITE FOR A MORE DETAILED CALENDAR - - THANK YOU! VILLA UNO VIEQUES IS TRULY AN AMAZING PROPERTY - OUR REVIEWS SAY IT ALL!!! Bathrooms are each individually designed, and include custom executed concrete vanities inlaid with shells, sea glass and coral tiles, and appointments throughout to provide a special experience. 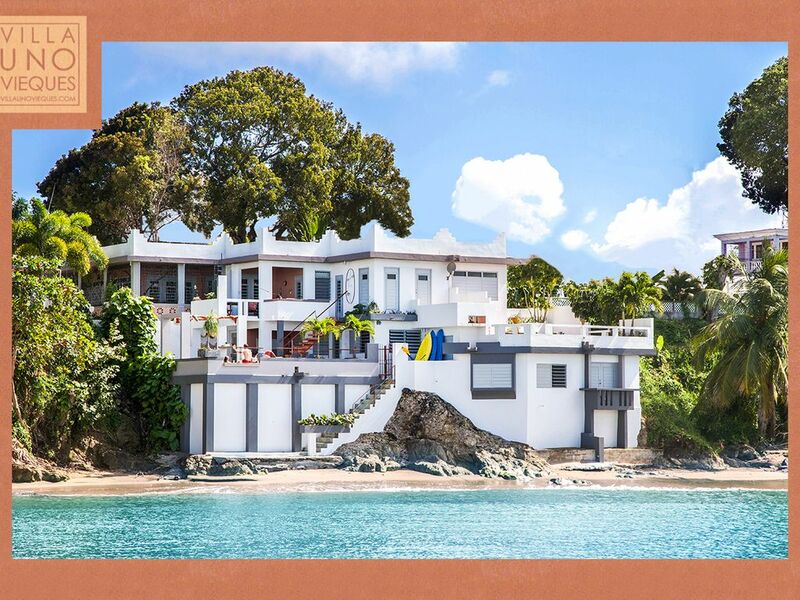 The professionally designed interior and exterior spaces feature custom concrete counters inlaid with sea glass, nautilus shells and natural stones, fine woodwork, beautiful furnishings and accessories, and a notable art collection built around the Vieques School of painters and sculptors. The seaside pool with its charcoal stained walls and multi-level coral colored stone detailing provides a refreshing and panoramic haven for all guests. A rear courtyard with street entrance includes an outdoor shower, laundry facilities, gas grille, and access to each unit's private rear entrance. The unique and gracious, multi-level indoor and outdoor spaces of Villa Uno accommodate everything from a sunset cocktail soiree, or intimate dinner party, to large buffet receptions. The staff of Villa Uno will gladly recommend catering services through complete detailing of party planning at any level to make every event remarkably memorable. The house is located in a convenient location--all stores are walk-able in town and the ferry terminal is a short walk (the downfall of this is the ferry traffic pulling into port and hearing the horn in the early morning hours). The house had nice outdoor spaces for our family of 9 to be together but also a lot of room to spread out and be separate. It is not the most child friendly home--our 2 year old loved the pool but always needed an adult around with the various ledges and stairs. The house was also equipped with all beach necessities. Our biggest complaint was the poor communication with the owner leading up to the trip. Christine lives in Vieques so I would ask for her information from the start. She was very helpful once we arrived and said that she prefers to communicate with guests to answer their questions ahead of time. Overall, it was a great place to spend our vacation! Great location. Right on ocean yet right in town. Beautiful views. Short walk to grocery stores, restaurants, fish market, and ferry terminal. Plenty of room for our multigenerational group of 11 over the Christmas holidays. We particularly enjoyed the pool and the terraces. The only design downside was that the only space big enough for us all to sit down to a meal together was on the big terrace, which didn't work when it rained. The is house itself, while in pretty good shape, is still recovering from the hurricane. The windows couldn't be opened in one bedroom because they are still waiting for replacement parts. The smell of sewage in the lower part of the house came and went. It was not clear how much of this was due to a broken drain seal and how much to a systemic problem in the town due to the restoration of power from the big island having occurred just 4 days before we arrived. The house managers were very attentive in general and in trying to solve this problem, in particular. My family stayed at Villa Uno June 23-30. There were 16 of us plus a few local family the spent time with us at the villa. Where do I start? 1. Location - what a great location! The house is situated at the end of a dead end street so we easily fit all 4 Jeeps in the parking area - it did take a little maneuvering to get the right Jeep out at times. The grocery store is a block away - we walked to it easily 4 times a day! The Panerea is right down the street - and the bread there is just unbelievable! There are several restaurants and bars in walking distance. I was really sad to find Mamasonga's bar on the last day - it was delightful - reasonably priced food and drinks and Tree Iguanas everywhere - had we found it earlier - it would have been our hangout for a snack!! 2. Beach - this is what I worried about - what was the beach like in front of the Villa. Well, it was wonderful - perfect for swimming and snorkeling. Lots of sea glass on the beach!! There is a really cool wrecked ship about 100 yards down the beach that had some great snorkeling around it!! There is also a little Bar a few places down on the beach called Azul. I would not call this beach a lay out in the sun and play in the sand beach, but, it was perfect for swimming and my kids were in it every day!! 3. Island - what a wonderful place!! We went everywhere - Sun Bay Beach was gorgeous - the Bio Bay Kayak tour was out of this world!! We went to Red Beach, went Mango picking, visited the fort, spent a lot of time in Esperanza, took a Jeep tour around the entire island. 4. The Villa itself - the pictures really don't do it justice. The layout is so interesting - I kept running into stairs or doors I hadn't seen!! Everyone had their own room (although my kids slept in the living room in our suite) and almost everyone had their own bathroom! The beds were really comfy and the air conditioners worked GREAT!! The shared areas are really well thought out - we spent most of our time by the pool where there was a nice shady spot for when the sun got a bit too hot!! The back porch was great for laying out and getting some rays!! There were 3 kitchens with Fridges and Coffee Makers which was great!! There are beach chairs and ice chests to take to the beach which is really helpful!! 5. Now, the things we didn't love - really only 2 things - the fan in the kitchen and top living area didn't work - which made it really hot when we were cooking !! This is a great house with a great location. When I read how the house was 2 blocks from downtown I was a little nervous that it would be noisy/not enough privacy. Instead it was the best of both worlds. When at the house and at the water we had complete privacy, quiet and relaxation. But it was so convenient to walk a couple of blocks to get donuts in the morning or pick something up in the grocery store. I felt totally safe walking around on my own (even as a petite woman and tourist) unlike other islands we have visited. The downtown is tiny and quaint. It is smaller than Esperanza which I preferred though we made several easy trips into Esperenza as well. We have rented several other houses on other islands. I have quickly learned that when a house sleeps a certain number it does not mean they are all nice/comfortable sleeping arrangements. Usually when a house says "sleeps 10" I expect 6-8 comfortable beds. This house truly comfortably sleeps as many as it claims it does. You could easily have 7 couples there comfortably and with privacy. We were shocked that there were two other kitchens in two of the bedrooms in addition to the kitchen in the main house. All the rooms offered air-conditioning but we never turned our on bc we preferred the fresh air and breezes and the sounds of the waves. Many houses we have previously rented only provide the bare minimums. This felt like a home that friend was lending to you and trusted you with. They were not nickel and diming us by any means. In fact, we felt pampered by the owners with all the extras they provided: nice shampoos, A GIFT BASKET!, plenty of towels, bags of ice for our beach trips, and much more. The kayak was a lot of fun and a bonus. I just asked my husband what I should add about the house and he said "It was a perfect house for vacation. There was nothing for them to change." We adored the house manger, Marc. He spent a ton of time with us when we arrived showing us the house and high-lighting the island on a map for us. You can tell he loves the island and he wanted to be sure we had all the info. we needed to make the most of our time. He even brought us sturdy boogie boards when he heard we were exploring one of the beaches w/bigger waves. And he offered to take us to the airport the last day even though I had planned on using a taxi. It was so convenient to have the kitchen stocked by Bueno Provenco (sp?) upon arrival. They were great too. And btw Vieques is GORGEOUS! Wonderful hosts and a wonderful vacation home! My girlfriends and I booked a last-minute trip to Vieques last month, and though we had just a couple of days to find and book lodging, Clark (one of the owners) couldn't have made it a more smooth and relaxing process. He was incredibly responsive and accommodating to our every inquiry and request. Everything about Villa Uno was top notch. It was obvious that quite a bit of thought and care was put into both the interior and exterior design (I could go on and on about the pool!) and it is incredibly well maintained. The villa was in tip top shape when we arrived, and the owners had put out a bottle of wine and some snacks to help us kick off our vacation after a long journey. They even arranged for someone to meet us at the ferry and walk us to the villa. We had the good fortune to meet two of the owners, Clark and Robert, upon our arrival. They gave us some excellent restaurant recommendations, and continued to proactively check-in throughout the week via email to offer advice on things to do and places to eat. They couldn't have been better hosts. I hope to return to Villa Uno one day soon! Situated in the town of Isabel Segunda, the location offers a variety of dining experiences, including delivery to Villa Uno's poolside. Nearby, there are specialty shops and convenience stores, a full-service grocery store, and Buen Provecho, purveyor of fine organics, produce and specialty foods. Black Beard Sports and Dive Shop, and the island's premier art gallery, Siddhia Hutchinson Fine Art Design Studio and Gallery are also just a few blocks away.